Snack? Dessert? You decide. Either way it’s a healthy treat you’ll feel no guilt when eating. I’m always on the lookout for healthy snacks for my family. 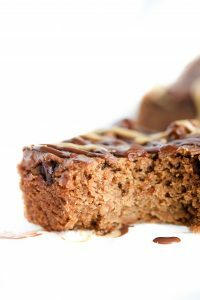 While a store-bought protein bar may be a convenient choice, it is not always the best option out there! Many are loaded with all types of sugars, artificial ingredients and allergens that can cause more harm than good. 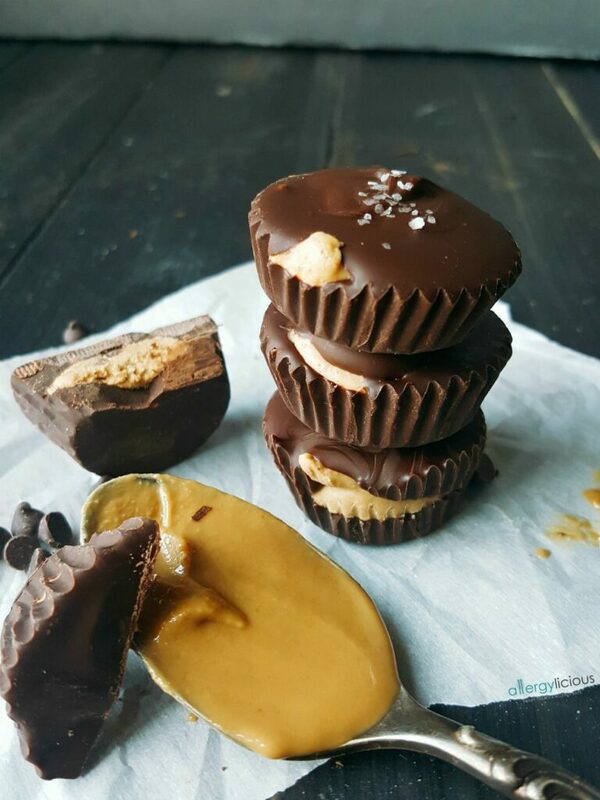 Luckily, this recipe for homemade SunButter Protein Cups are easy to make, have none of the junk, all of the clean protein and taste like dessert. It has quickly become one of our all time favorites. It’s a great grab and go, guilt-free snack that you and your family will love. I like to make these in bulk and then place in the fridge or freezer to grab when needed. Sadly, however, the freezer option rarely happens (unless I’m hiding a batch). Most of the time, they simply make it to the fridge and that’s it. It seems like they get eaten faster than I can get make them….but how can I complain about that when they are eating a healthier treat? 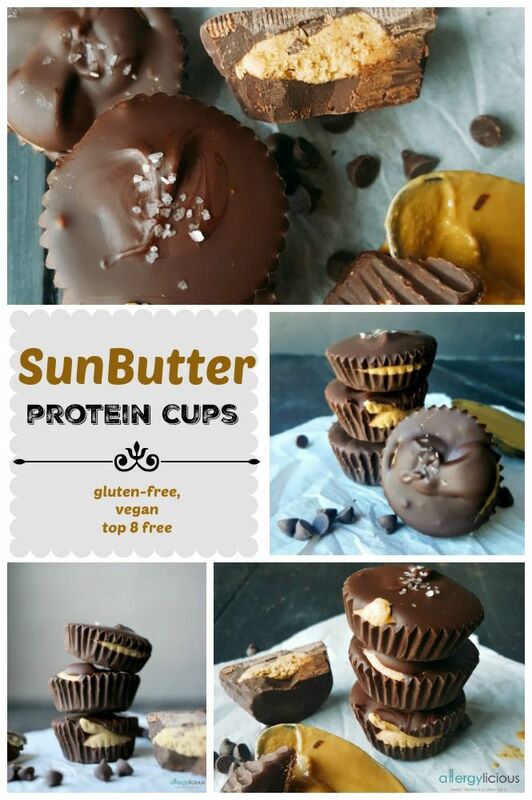 If you can carve out a little bit of time and make a big batch of SunButter Protein Cups, you’ll save money, have total control over the ingredients and know that you have a delightful treat that is free of any of your allergens. Plus, who doesn’t love some SunButter & chocolate now and then, especially when it’s this healthy? Seeds give a great dose of healthy fats. Vegan Protein powder provides a nice dose of protein without the worry of dairy or eggs. Coconut oil is a great healthy fat as well. Allergy-free. You can make these bars however you need to in order to avoid allergens or sensitivities but they are already top 8 free if you follow the recipe below. 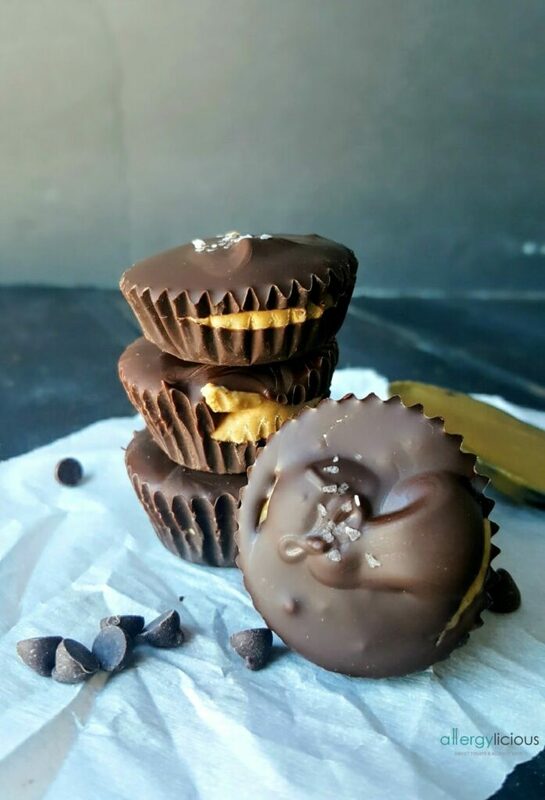 No Bake, homemade, protein packed SunButter Cups make for a healthier, allergy-friendly, snack or dessert. Guilt free, gluten free & vegan too. Line mini muffin tin with liners. In a saucepan, melt & stir together SunButter & coconut oil on low. Remove from heat & add in protein powder. Stir until smooth. Reserve 1/3 cup chocolate chips (set aside). Melt remaining cups over a double boiler, stirring to help melting process. Remove from heat then stir in remaining chocolate chips. Stir until those are melted. Add approx a tablespoon of melted chocolate into bottom of cupcake liners. Add tablespoon sized-SunButter mix on top of chocolate base and gently spread before topping with additional melted chocolate. Option- sprinkle with a pinch of sea salt. Freeze 20 minutes or until ready to serve. Store in refrigerator up to 2 weeks (if they last that long) and snack as desired. Disclaimer: This is a sponsored post. 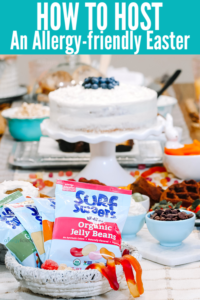 I am an official SunButter Blog Partner Ambassador and receive product and payment for creating awesome recipes using their products. All opinions & recipes are my own. Have you tried SunButter before? What is your favorite choice of spread? What do you use for a healthy “go-to” treat? Let’s continue to connect & encourage others with food allergies & restrictions. Follow Allergylicious on Facebook and invite your friends! 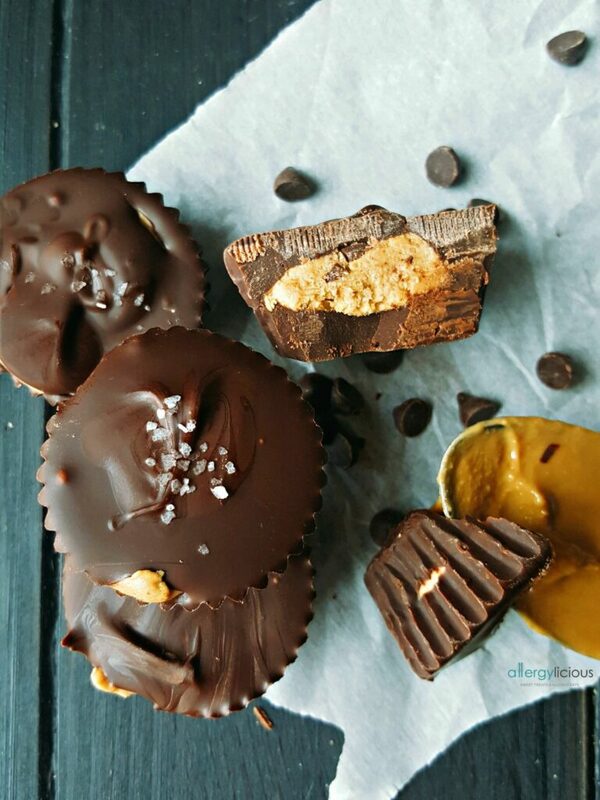 Find me on Instagram and Tag #allergylicious with your awesome remakes! You can also find me on Pinterest sharing the newest, delicious, allergy-friendly foods. Making these this weekend!!!!! I’m so excited!!!! Thanks for sharing!!!!! 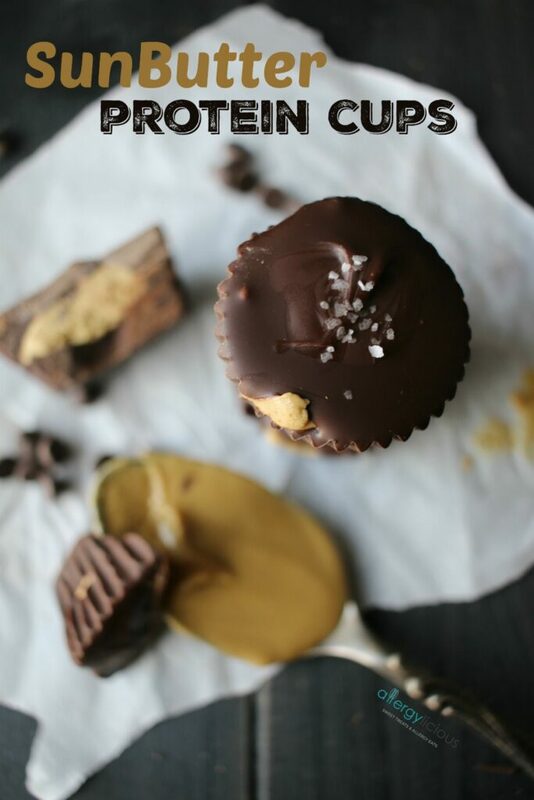 Chocolate and SunButter is one of my favorite flavor combinations! 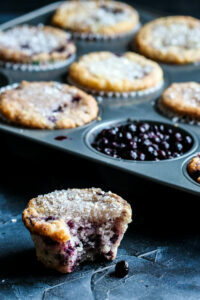 Did you use silicone muffin liners or just regular paper kind? I’m looking forward to making these with the added salt on top! I bet it’s delish! I have every delicious ingredient on hand – including that coarse sea salt topper. These are getting made! Yay! Its a party at your house tonight! Those look so good! I wonder if there is a nut & seed free alternative to use. Can you do soy? I.M. Soynut Better is one of the better ones I’ve tried. If you can do peas, then Sneaky Chef is awesome. Oh man, I need these. I love sun butter and chocolate! 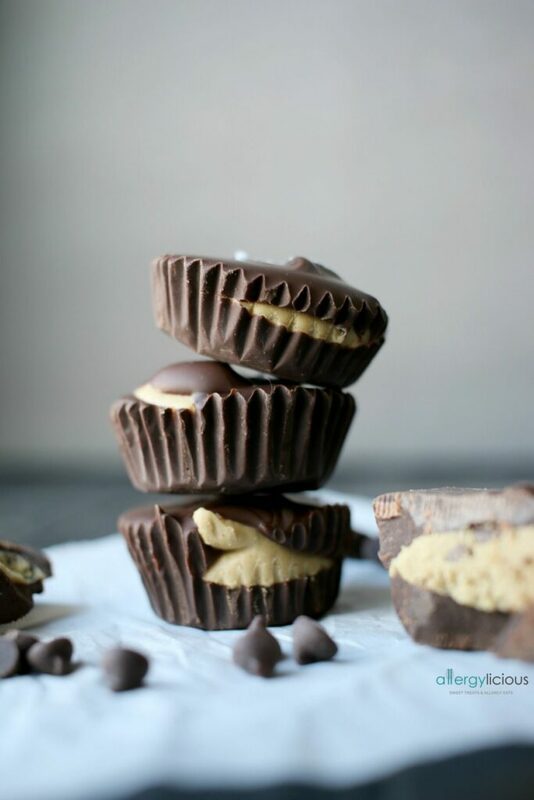 Gotta have out chocolate cups! I love that you put protein powder in these! They looks scrumptious. Yes girl yes! I think I can make this…I mean, I CAN make this – I just hope I don’t screw them up. Such a good idea adding protein powder in them. These look delicious! I tried a recipe for these from a cookbook once but they were all gooey inside and never hardened. Yours look perfect, can’t wait to try them. Really? The middle consistency in these aren’t gooey or runny at all. I just had to push down to spread it out a bit. It was REALLY hard work (lol). I love everything about this recipe! It will be made very soon…possibly tonight! Oh, please let me know how they turn out. Can’t wait for you to try it. These look so good! Nut butter, haven’t had non nut yet, cups are my fav! I will have to give these a try and make them for A the next time she has a class where there can’t be nuts. I love how you took out all of that extra “stuff” but didn’t sacrifice on flavor! My two girls would love these, as well as my husband!